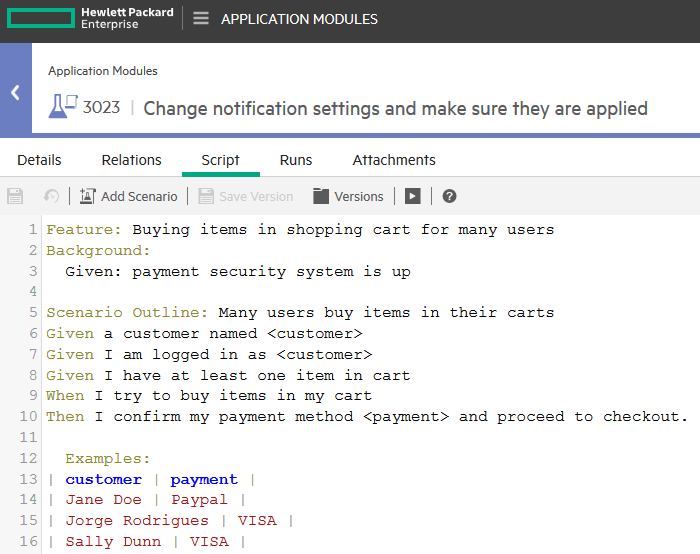 On March 19 HPE announced the upcoming availability of its “Next Generation ALM” (NG ALM) product as a beta version. In a previous post I shortly described HPE’s intended direction to support bimodal IT with this offering. Since then I had the chance to look up the beta version. In this post I describe some of my findings. The product has so many areas that I need to focus on some of the highlights. It is not the goal of this blog to provide a complete overview. Be aware that the product is still in a state of flux, so features might have already changed by the time of this writing. Furthermore, it is safe to assume that the released product will look different (and this will definitely be the case for the product name). According to HPE NG ALM targets the modern way of developing software products from the very beginning until delivery. This way the entire value stream for product generation is covered. To support this NG ALM provides 5 entry points to the user: Dashboard, backlog, application modules, pipelines, and defects. Notice that there is no “testing” entry; more about that later. For a given software product those entities are related to each other. NG ALM utilizes a couple of concepts to express these relationships: Hierarchies, relationships, and tagging. I will describe more about those within the specific product area. The dashboard provides aggregated information about various aspects of product generation. Individual widgets can be configured based on user needs. 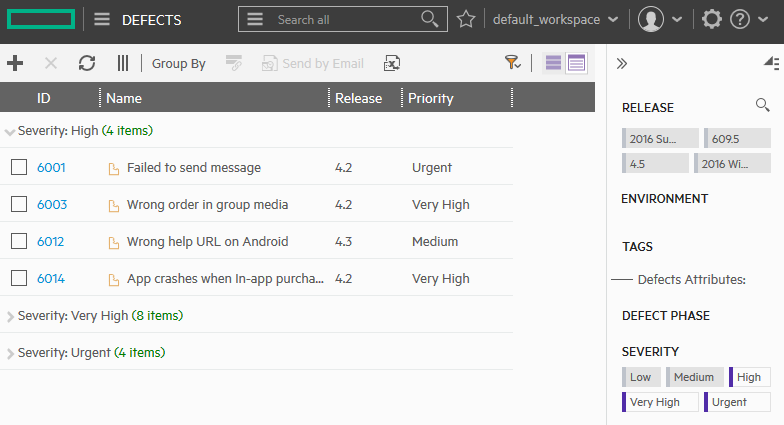 Similar to widgets available in HPE’s Agile Manager additional data is provided when hovering over the graphics as illustrated in the screenshot below. NG ALM allows to perform detailed analysis of this data via drill down capabilities that are accessible directly from these graphs. 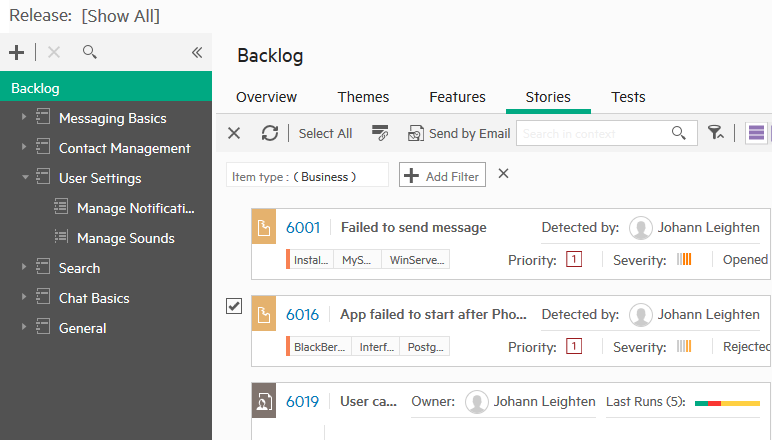 The backlog area contains various aspects to work on: Themes, Features, Stories, and Tests. Themes and Features are organized hierarchically. Themes provide the highest level of organization. They represent large grained application areas that can be described by a set of individual features underneath them. 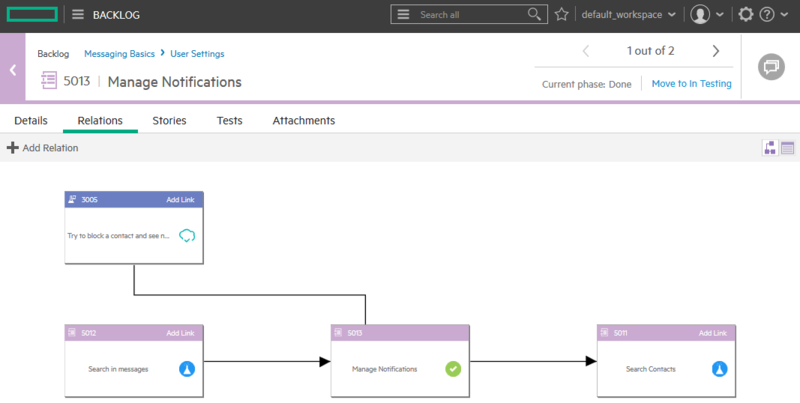 Features will have stories attached that implement the feature and tests to validate the stories. Defects may be also located at the feature or story level. NG ALM utilizes freely definable tags to support efficient and effective work environments. They are optionally visible on the right side of the screen and can be turned on and off via simple clicks. Tagging and filtering is nicely grouped together and can be used in combination. Stories will be tested thus having a relationship to test entities. During the life cycle of a software product tests will be conducted often. A user will have to create the relationship between the user story and test, NG ALM will automatically create relationships between tests and individual runs of those tests. For analysis purposes these relationships can be viewed at in a graphical manner. These graphs provide direct access to details of the displayed elements if desired. The application module area allows to arrange tests in a way to support long term needs of the organization. Often this might be an architectural view of the product. But there might be other organizational aspects that are of interest. 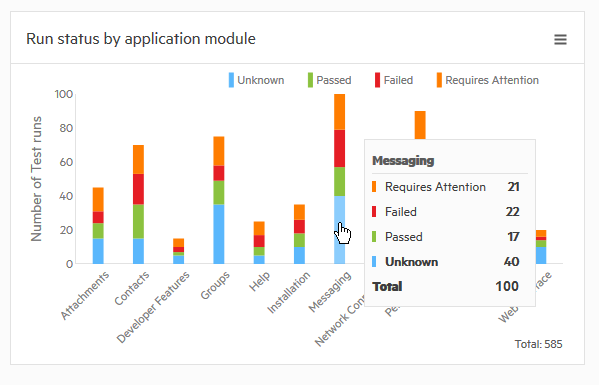 There is no longer a split into separate application modules of test design and test execution as in the current ALM product. Runs can be directly accessed from the tests. Tests can be assigned to multiple application modules. Besides manual tests NG ALM provides a new way into automated testing by utilizing the Gherkin framework. Gherkin is a business readable, Domain Specific Language (DSL) that lets you describe software behavior without detailing how that behavior is implemented. Gherkin became prominent in recent years in context with agile methods that favor a high degree of test automation. Gherkin tests are handled like development artifacts and stored in a configuration management system. Each time a developer finishes coding an automated build can be triggered along with automated tests. This development approach results in fast-paced and high quality software production. The defects area delivers pretty much what you would expect from it: Views into the defects of a software product from various use aspects. Modern filtering, tagging and grouping is supported within that module. The pipeline area brings it all together. It is a direct linkage into the build, test and deploy environment. NG ALM provides direct control of those build processes. Out of the box it provides management capabilities of the Jenkins environment. Automatic assignment of tests to application areas can be configured using test assignment rules. Each time a new test matches such a description the test will be automatically assigned to the specified test area. NG ALM provides an impressive new approach of HPE into the modern way of developing software. The product can be used with any modern browser which is a big advantage over the existing HPE ALM product. HPE also provides several integrations / synchronizations into its flagship products to allow immediate benefits for early adopters. New key functionalities are the test automation framework Gherkin and the pipeline approach. They address the move into an agile way of developing software and managing the DevOps challenge. What will be the role of traditional requirements in this environment? What are the relationships to business modeling and business process testing? I will closely monitor how HPE is following up on those challenges and other feedback from the customer community. Stay tuned for more exciting news. Update on June 1, 2016: The product is released and got the official name HPE ALM Octane.